I have fielded a lot of questions and feedback on the recent Oregon Stay-at-Home Parents report our office issued last week. For the record, we have copy-edited the report and reissued it on the previous post, although no substantive changes have been made. What follows is a roundup of a few of the major themes from the feedback. First, the biggest question and/or surprise was the relative lack of stay-at-home fathers. Just 1 in 100 prime working age dads say they are staying home specifically to care for the family. 1 in 5 mothers cite the same reason. Here it is important to keep in mind a few things. Nearly 10% of fathers are at home for any reason — that is, they are not in the labor force — but most cite other reasons for that, other than taking care of the kids. Some of this may just be a reporting/question item in which men are more likely to cite, for example, a bad back or poor economy instead of looking after the kids. As Pew Research found, society is much more supportive of mothers staying home than fathers doing so, thus lending some credence to a potential social stigma. If one includes the number of unemployed fathers as well, the overall number rises to about 16% of all dads that are not at work, thus presumably at home. This works out to a 6.4% unemployment rate for fathers in Oregon, which at first blush seems low given the time period (2011-13). However a similar measure at the national level (all adults, not just prime working age) is 5.6%, which is close. However, from an economic point of view, the reason for being at home matters. Not that unemployed fathers or those enrolled in school do not like being at home, but they are also more likely to work, provided the opportunity. Thus the impact on the broader society trends is likely minimal, relative to the economic conditions. Even in two parent (or two adult) households, when one parent works and the other does not, the vast majority of the time it is the dad who works (more on this below). 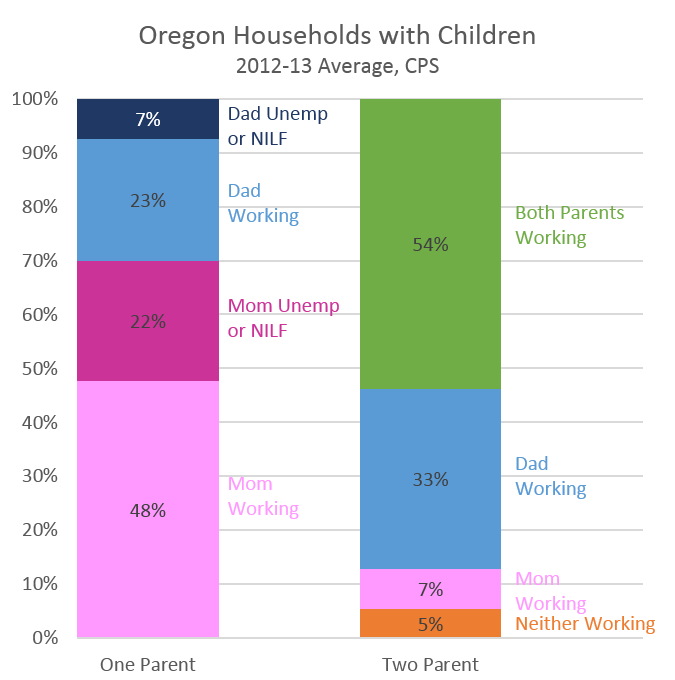 The second major theme was surrounding the composition of households in Oregon, how do two parent households compare and the like. If one were to do a proper study on households in Oregon, a more careful examination of Census or American Community Survey data would be much preferred. However, to save time and given I have the detailed Current Population Survey data readily available, what follows is indicative of the broader patterns seen in the state. The precise figures should be taken with a grain of salt, given the sample size for the CPS is smaller than the ACS. With that being said, here is a quick overview of household composition and employment in Oregon over 2012 and 2013. The vast majority of one parent households are single moms and the vast majority of both single moms and single dads do work. Only a minority of single parents do not work at all. In terms of two parent households, both parents work in a majority of them. However when just one parent works, it is nearly always the father (about 83% of the time). Lastly, the Council of Economic Advisors just released a new report (PDF) for President Obama’s Working Families Summit yesterday (June 23rd). There are lots of good facts and figures on working parents, share of household duties, child care costs, family leave and the like.